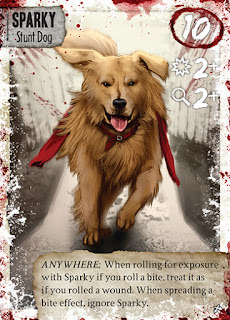 I don't say this easily, but Dead of Winter is the best designed game I have played this year. Every turn matters; every choice matters. Your individual actions are loaded with uncertainty, as you decide whether or not an action might kill your characters. Is the risk too high for the chance to find medicine? There's always the need for more food and medicine at the colony, after all. Is the sacrifice you make going to keep the group going strong, or is Dana actually a traitor, and your generosity in giving him weapons going to bite you back in the end? This is a game about survival, and it does what a lot games try to do, and never quite make it: you feel the experience yourself. 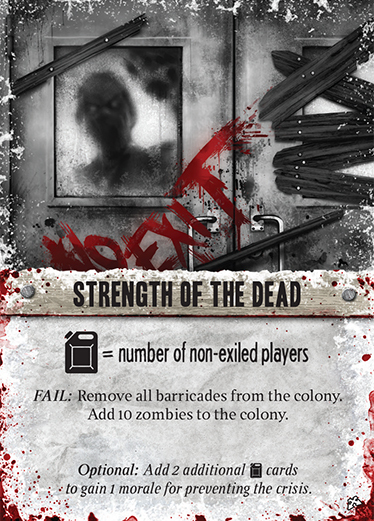 If you're still reading this after that fan-boyesque introduction, Dead of Winter is a board game that covers familiar territory for many: the zombie apocalypse. Now, many of you reading this tuned out, frustrated with iteration after iteration of the walking dead in popular culture, and often times, I would be right beside you. However, hold on just a little bit longer: zombies are here, but they aren't the the real problem. Instead, they're just the engine, the motor behind the real star of the story, which is the brutal focus on group survival. What's a worse way to die: zombie attack, starvation, or the betrayal of your comrades? This game makes you dread the thought of being out of soup cans. This game makes you anxiously double-check if there's enough fuel to safely travel across the abandoned town without the worry of frostbite. After a turn of bad luck, you find yourself looking at the other players, wondering if one of them is purposefully trying to ruin the colony that you've sweat and bled for all game. Should you hold onto some of the resources for your own benefit, or go all in to help the others with you? Dead of Winter is, in the developer's own words, "a meta-cooperative psychological survival game". That's a big phrase to chew down, but the gist of it is this: as a colony, your goal is to have the group survive. If the colony breaks down by losing all morale because of starvation, too many deaths, or other factors, then everyone loses. This establishes that sense of teamwork, of cooperative play around the table. However, every player also has a secret objective they're also trying to accomplish. It's represent's the characters deep insecurities and base needs, yearning to be met. You can 'win' the game, but not come out on top. It makes the game more tense, as all of you work together, but are hedging to also become the one that comes out on top. While everyone wants to accomplish the main objective, here finding medicine for a cure, you also will want to stock up on food or weapons for yourself, tending to your own needs. Say, why's that one card say 'betrayal'...? ...That is, unless, you have a dirty, dirty betrayer in your midst. At the start of the game, you shuffle one betrayer card together with two regular objectives per player, then deal one out secretly to everyone. This means that some games - not all - there is someone against you. If someone is actively trying to tank your game, you might suddenly see irrational actions, where someone 'forgets' to add food to the pile for a few rounds. Maybe someone's characters seem to die more often by taking risky actions, or the wrong resources are being added to your crisis pile, making you fail and lose morale at a critical moment. While you're busy trying to survive, someone wants you dead, and it's up to you and the rest to exile the right person. Granted, exiling is up to team votes, and so these moments of exile can go hilariously screwy. I've played a game where I figured out we were being betrayed, and my friend who was the betrayer got everyone to gang up on me instead. I was kicked out, given a new 'exiled' objective, and then was able to reveal that I wasn't the betrayer. My 'friend' promptly had another turn to ruin their day, mismanaging items to make it so goals weren't met in time, tanking the team. This is one of the easy Crisis cards. I'm not kidding. Again, part of the fun of this is that there being a betrayer is not always a guaranteed thing. The game doesn't even need them to be difficult. There are ten different main colony objectives to choose from, so each time you sit down to play the game, there's a chance for a very different experience right out the gate. This pairs with the crisis cards, as seen above: every round of play, there's a different mini objective besides having enough food and keeping zombies out of camp that becomes a major issue. If it's not met, well, morale is lost, characters die, or a few other effects that can cause your attempts to save your colony to grind to a halt. It says a lot that having zombies added to the board is one of the least worrying effects of a failed crisis in this game. This leads me back to the fact that this is a zombie apocalypse, and so the shambling dead make their presence known in the game. Sometimes, thanks to the scenario, it's out the gate. Sometimes, you can ignore them for half the game...but eventually, they appear on your doorstep, in greater and greater numbers. They don't run and chase after you like in games like Zombicide or Left 4 Dead, but just end up being an ever-present threat. Once there are too many added at the end of the turn, they break in, automatically killing survivors without any rolls for salvation. However, dealing with them before that critical point can lead to terrible problems as well. You see, there's this wonderful thing called the 'exposure die'...which has been known in my house to cause people to start rocking back and forth in their chair when they realize they have to roll it. Every time you kill a zombie without the help of special items, there's a a 50/50 chance something bad is going to happen. Either you take a wound, gain frostbite from enduring the cold of winter, or, the absolute worst thing happens....a bite. When that one-in-twelve chance goes off, your character immediately dies, and another character at the same location has to make a choice: either immediately sacrifice that character to stop the spread of an infection, or try their luck on that die. If they roll anything besides a blank, that character dies as well...and the cycle continues, spiraling into hopelessness. Threre aren't many zombies yet, but do you want to wait for the threat to get worse, or risk death now? That red die WILL kill you. It should also be mentioned that moving out of the colony into the town to search can also be a death sentence too. Moving without fuel causes you to roll on the exposure die as well, meaning that your walk through the snow led you right into the jaws of death. This game comes down to tough choices, and trying to figure out the best way to whittle down your chances of unfortunate death. Is the risk worth it to find that shotgun? Weapons can make it so future zombie kills can be less lethal, with less rolls for exposure, but will a loss of morale now end the game? The constant threat of a critical issue breaking your team does a lot to make this game constantly engaging. I can't get over how well designed the game is, and that's for two reasons: how much variability and replayability has been built into game at the ground level. More importantly, these variables don't seem to detract from the game by making it feel too hard to or easy, because there's simply so many ways something can go wrong, or throw you a bone at the right time. For starters, while the game plays with 2-5 people at a time, there are 24 different secret objectives, and 10 just for betrayers. When you pair up that random distribution of goals with the main objective you choose, that's a massive amount different game-play. The survivors you get at the start of the game, and during, are random. They range from janitors to soldiers to...stunt dogs. Sparky is a favorite at my house, for obvious reasons. The best example of Dead of Winter's variability comes from the Crossroads deck, where every turn, the player to your left takes a card off the top, and holds onto it, seeing if it's 'trigger' event goes off during your turn. If it doesn't, nothing happens, it goes back to the deck, and no one knows what might have happened. If you trigger the event, your life suddenly gets more complicated. A trip to the grocery store might have you end up lost in a blizzard, having to roll for more exposure die if you keep going, or turn around and be forced to stay still. Searching the police station might make it so armed survivors find you, and in exchange for free weapons, give you an additional objective of clearing zombies out of their town. There are eighty of these cards, and many have the ability to give you a much needed boost of supplies, or demolish your morale at the wrong moment. Almost all have a choice involved between two options; again, this helps with the randomness this deck seems to add to the game, putting control back in your hands about the chances of what will happen next. Crossroads can give you a much needed boost if you take a risk, or can complicate your life by crippling or killing characters that you control. For me, Dead of Winter hits that sweet spot that State of Decay did as a video game: it's not about the immediate jump scare, but the rising sense of dread. Here though, the fun is compounded by the fact that you are playing alongside friends. The game has gotten more intriguing the more I play it, rather than losing it's shiny 'new' feeling. I've played over a dozen times, and we still haven't dared to try the medium or long objective games...much less hard mode. We've had a handful of betrayers, sure, but we've only scratched the surface of how many ways things can go south for us. This game has been in short supply since it's creation, and after finally having lots of hands-on time, I can safely say there's a good reason for it. 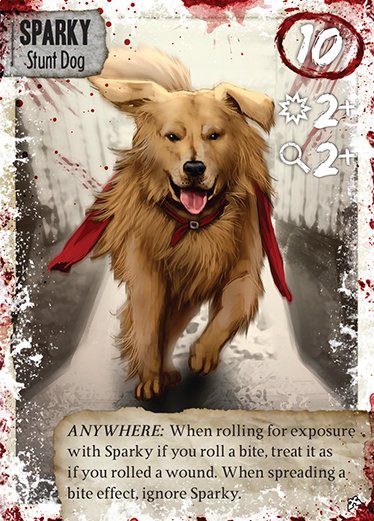 Dead of Winter is worth every penny, as out of the twenty-plus people I've introduced it to, everyone has liked it. The reactions range from laughter to saying that their heart was pounding as the game round hit zero, but all in the end said the time was well spent. Will you survive the cold winter this game represents? You should probably go find out, and bring your friends with you.